One traditional design for a pocket scorekeeper has two numbered wheels made of stiff leather sandwiched between a faceplate and a backplate, also made of stiff leather. The problem with this scorekeeper is that it is poorly made (or perhaps poorly designed). The colored face is thin paper glued to the leather body. After moderate use, the paper face begins to peel away. The tightness of the aluminum screws determines how easily the scoring wheels can be turned. It is difficult to adjust the screws so that they are neither too tight nor too loose. The screws tend to loosen with use or vibration. If you drive around with this scorekeeper in your car, road vibrations will cause the screws to work loose and fall out, and possibly get lost. What she came up with was a simple universal pocket scorekeeper. Like the traditional scorekeeper, it has a set of wheels for “us” and “them”. (Well, “me” and “you”.) Its four independent numbered wheels can record scores of up to 99 for virtually any sport. (It is available from Jill’s web site, www.pocketscorekeeper.com, for $6.99 plus $3.00 shipping.) The plastic construction is rugged, and the straightforward simplicity of the idea is great, but I found the wheels to be stiff and difficult to advance. I needed to use both hands to change the score. I’m diabetic, and I use disposable insulin pens. To use an insulin pen, you twist the end of the pen— click, click, click— and dial in the number of units of insulin that you want to inject. When the pen is empty, you throw it away. 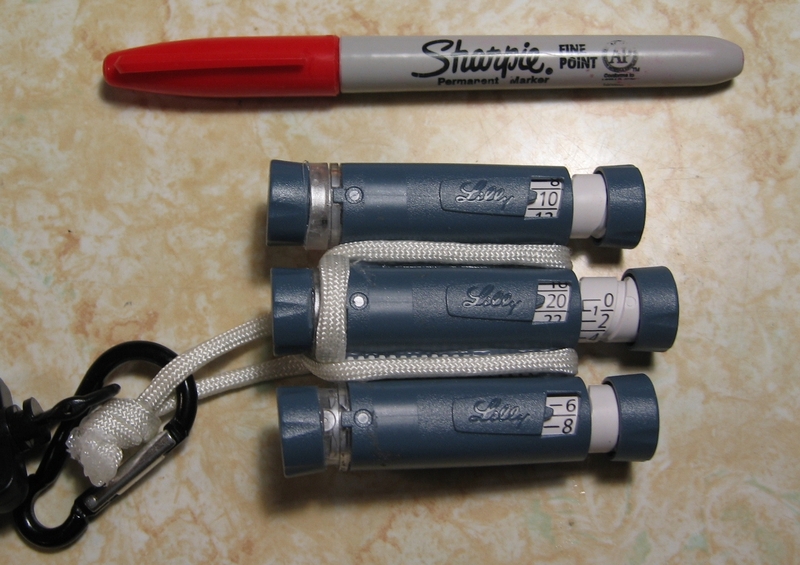 I took three of these discarded pens, cut off the ends with the twist counter, and glued them together in parallel to make a pocket scorekeeper. This triple-barrel design is quite useful. It is sturdier than the Obut scorekeeper and easier to use than the Pocket Scorekeeper. In a cut-throat game, three players play against each other and you need to keep track of three scores, one for each player. That’s easy to do with this design. Our favorite cut-throat game is Two Jacks, which is played to a winning score of 21. This scorekeeper is capable of recording scores of 21 (and more). The best short form of petanque is one in which games are played to a fixed number of mènes. The third counter can be used to record the number of menes. Very handy. If Obut was smart, THIS is the pocket scorekeeper that they would be selling. The requirements for a petanque scorekeeper app are quite simple. You need to be able to increase (and, in case of a mistake, decrease) the score of each of two teams. You need to be able to reset the scores to zero. And it might be nice to be able to count the number of menes played. 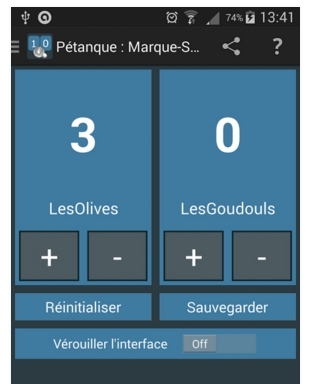 For Android, Pétanque: Marque Scores looks promising. It has a lot more features than just the basic ones I mentioned. Not surprisingly, it looks like it is the creation of a French software developer. Apple’s app store didn’t seem to have any good petanque scorekeeper apps. Two general-purpose scorekeeper apps that had good reviews were Swipe Scoreboard and Score Keeper HD Lite. This entry was posted in Equipment by Jules Lenoir. Bookmark the permalink.